Ricky Yu is a Luna therapist serving the Peninsula region of the Bay area. Ricky also works at Stanford. His LinkedIn bio can be found here. The road to becoming a physical therapist is varied, but there is usually a common theme: someone gets injured, undergoes therapy, becomes inspired, falls in love with the profession, and eventually becomes a physical therapist. This says a tremendous amount about our profession, one which changes people’s lives in a multitude of ways. Luckily, physical therapy is led by those who have seen first-hand the impact that a truly passionate and compassionate healer has on those for whom they care. This is the story of a completely altered career path. My friend and teammate on Columbia’s Physicians and Surgeons Rugby Football Club, Yannis, was a fourth-year postdoctoral fellow at Columbia University completing research in genetics and neuroscience at one of the most prestigious labs in the world. As a side gig, he was our rugby coach. Yannis had grown up in England and played the sport since he was a child. After completing undergrad, he had a stint coaching rugby in Tonga, where both the national sport and pastime is rugby. Yannis was an excellent player and coach. In the Spring of 2012, my teammates and I were preparing for the annual John C. Wood, Jr. M.D. '76 Memorial Tournament, a tournament to honor the memory of a Columbia graduate who had been tragically shot and killed. At the time, I had played rugby for three years with Columbia’s P&S Rugby Club while finishing up my physical therapy degree. If you are not familiar with rugby, it is an aggressive contact sport, like American football, with continuous ball progression and hard tackles. 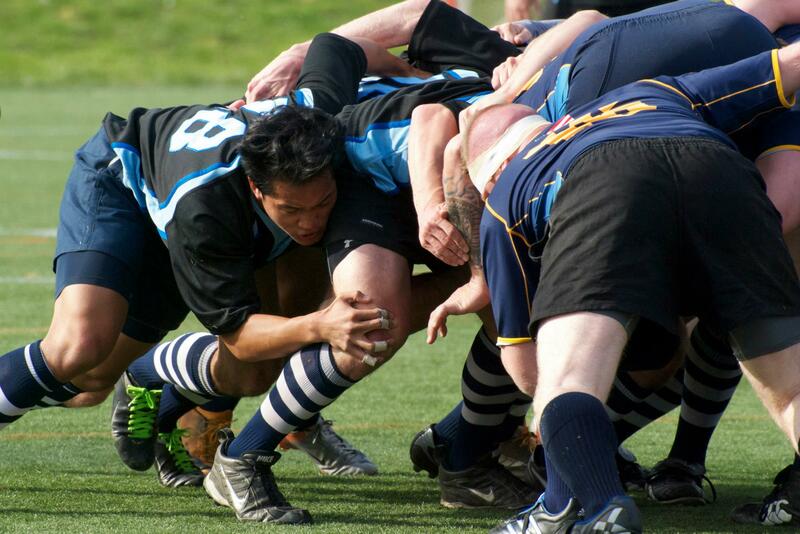 Players endure intense matches without the protection of helmets or padding while rucking, mauling, and scrummaging. Traumatic contact injuries, especially to the head, are commonplace. Non-contact injuries are also frequent due to the game’s speed combined with lateral movement and cutting. During my years playing rugby I sustained sprained ankles and wrists, fractured ribs, strained rotator cuffs, and finally a lacerated kidney, which ended my participation in the sport. Mere days before the tournament, Yannis was conducting a typical training session for our team. While scrimmaging, Yannis caught a pass, evaded a tackle, cut, and...POP. I remember clearly the angle at which he landed. Completely non-contact, he landed to plant and cut. His knee fell into the all-too-familiar dynamic valgus and femoral internal rotation. All of us on the field knew this was not good and we began to fear the worst. Thankfully, Yannis was surrounded by a team full of young adults studying medicine and two studying physical therapy. The medical students quickly deferred to me and the other physical therapy student to attempt to triage Yannis as we had had orthopedic experience during our clinical rotations and in our coursework. We did a quick screen and began to suspect a possible anterior cruciate ligament (ACL) tear. At this point, we decided that because Yannis was stable, we should take him to the emergency room. In the ER, doctors completed imaging of his knee, which confirmed our suspicion of an ACL injury. To make matters worse, his ACL tear was combined with tears of his medial collateral ligament (MCL) and medial meniscus. Yannis eventually underwent surgery to repair his ACL, MCL, and meniscus. He then faced months of grueling physical therapy. By chance, he was seen and treated by a classmate of mine who was completing her physical therapy internship. Her infectious personality and enthusiasm for the field ignited a spark in Yannis’ mind. He began to fall in love with the very profession that was healing him. He was at a crossroads while in the thick of his career as a scientist. Ahead of him lay years of bench research and competition within academia. He chose instead to follow his heart into the clinic. Yannis enrolled shortly thereafter in Columbia’s physical therapy program and is now a practicing physical therapist in New York City. Yannis’ story is important to us as clinicians because we have the power to inspire those who come to us seeking help, whether to become therapists themselves or to return to activities they are afraid to go back to because of prior injuries. Yannis is now taking the opportunity to help those who are walking the same road he once walked. He loves his work now as a physical therapist and his continuing work as a healer beyond the mere physical. Everyday that I go into work I am reminded of this story. We have the power to change lives. We should cherish the positive impact we can have on our community.